This modern spacious Two Bedroom Two Bathroom apartment with relaxing balcony is fully furnished and available to lease short term or long term. The master bedroom has an en suite queen bed large wardrobe and fitted with a study desk. The second bedroom also has a queen bed and built in robe. Each bedroom has reverse cycle air-conditioning as does the lounge. The open plan dining and living area leads out to a large balcony which is north facing and sunny all year round. Storeroom located on the ground floor for your extra belongings and single car bay in a secure gated complex. NBN available at the complex. 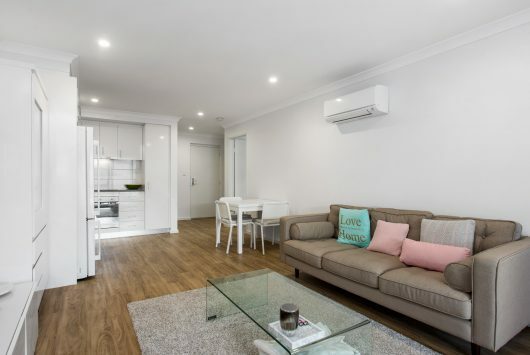 Located within minutes to the airport and CBD and on major transport links and extra parking available for tenants. 9. Huge store room to store your extra goods. On the main bus routes to Belmont Forum, CBD and airport. Safe secure easy to care for unit. © 2017 Website by Social Goodness.